Why then is there such little anger against the British while the Muslim rule is (rightly) reviled? They came, they saw, they conquered — and they left with a fortune. The story of how 190 years of British colonial occupation, from 1757 to 1947, impoverished India is one of the great untold stories of modern history. Congress member of Parliament and former junior external affairs minister Shashi Tharoor tried valiantly to tell the story in his 2017 book, The Inglorious Empire: What the British Did to India, but gaps remain. What, for example, was the quantum in inflation-adjusted wealth siphoned out of India by the colonial British? What was the modus operandi colonial officials employed? Should India seek reparations — and how might these be credibly computed? Some of these questions have now been answered by the economist Professor Utsa Patnaik. She recently published a collection of essays in Columbia University Press detailing the method of the two-century-long British theft, its computation at today’s currency value, and a possible mode of reparations. Crucially, Professor Patnaik does what Tharoor in his otherwise fine book (Indian edition: An Era of Darkness: The British Empire in India) does not: she puts a figure on the British theft. 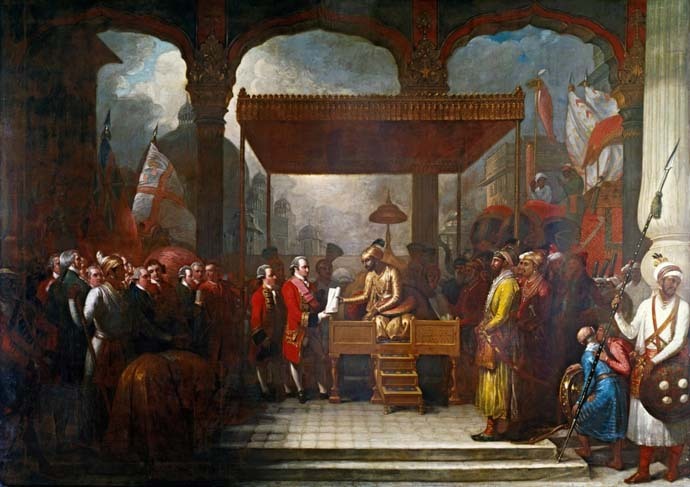 The Mughal emperor Shah Alam handing a scroll to Robert Clive, the governor of Bengal, which transferred tax collecting rights in Bengal, Bihar and Orissa to the East India Company. Illustration: Benjamin West (1738–1820)/ British Library. 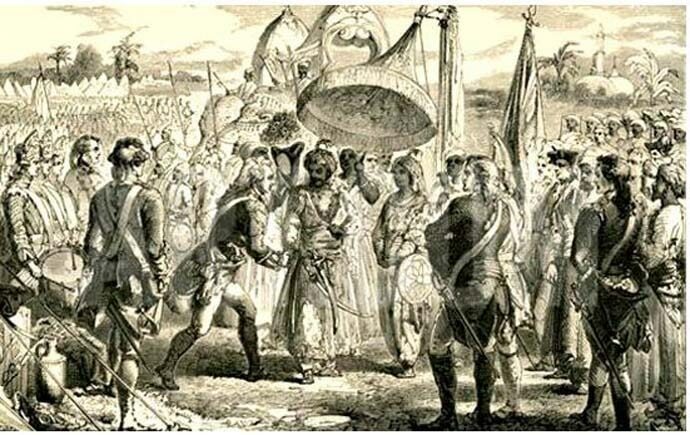 When Robert Clive defeated the Nawab of Bengal, Siraj ud-Daulah, in 1757 in the battle of Palashee (Plassey) by bribing the Nawab’s army commander, the traitorous Mir Jaffer, the real prize for the British was the right to collect tax from Bengali peasants, traders and farmers. The Nawab had levied a modest tax, allowing peasants a reasonable living. By 1765, within eight years of Clive’s victory over the Nawab, all that changed. Taxes in Bengal were trebled. 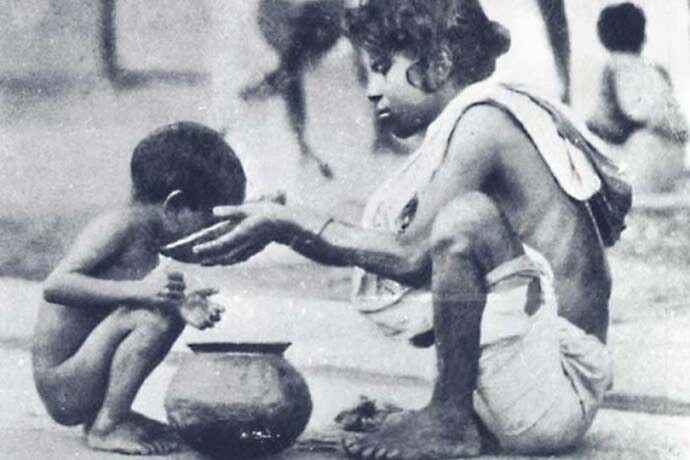 Unable to eke out a living, 10 million people out of Bengali’s population of 30 million died of starvation in 1770. Around 173 years later, in 1943, as the Second World War raged and the British Empire was on its last legs, Prime Minister Winston Churchill would withhold vital food grains from Bengal, leading to the Great Bengal Famine in which over three million people died. 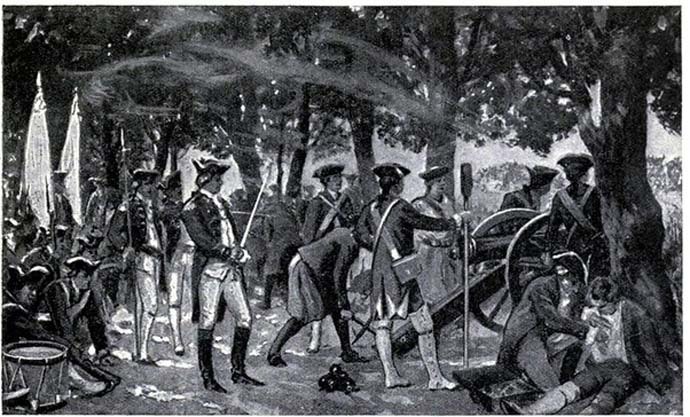 But back in 1770, the British were focused on making money. Britain was still a relatively poor country. The industrial revolution was some years away. The British were especially active in the African slave trade. Through much of the 1700s, Liverpool monopolised 55 per cent of the brutal Atlantic slave traffic. The United States was still a British colony. African slaves captured or bought by the British in Sierra Leone, Ghana and the Ivory Coast were shipped in British vessels to America, their arms and legs chained in manacles, lying one above the other. Dozens died during the horrific transatlantic journey. As Britain began to extort tax revenue from Indian peasants, the industrial revolution received a boost in terms of funds and raw materials from India. The British modus operandi was as simple as it was extortionate: it taxed Indian peasants 35 per cent of their income, three times what the Nawab of Bengal had taxed them. That excess tax revenue was then used by the British to buy Indian goods – spices, textiles and gold – which were in great demand in Europe and North America. Thus British tax collectors used Indian money to buy Indian goods, exported them and pocketed the profit – with zero investment. This system continued unimpeded virtually throughout the colonial period. In order to ensure that peasants, from whom they extorted steep taxes to buy Indian goods for export, did not realise how they were being cheated, a ruse was employed. The British tax collectors and British buyers of exportable goods were deliberately kept as completely separate entities so that no connection could be made by peasants whose taxes were being used to drain the country’s resources. Were the British thus more rapacious than the Mughals? Unquestionably. They impoverished India in a way the Mughals did not. That does not absolve the Mughal Empire. It was savage, destroyed thousands of temples, and converted lakhs of Hindus through the sword or through financial inducement. The Mughals were a destructive, malignant force. The British though exceeded them in the damage they did to India’s economy. Why then is there such little anger against the British while Muslim rule is (rightly) reviled? The reason is complex. Many Hindus in the 1700s were fed up of the debauched Mughal Empire. They were relieved when the British defeated the Mughals. They regarded the British, who brought new technology and avoided religious conversions, as the lesser evil. There are miniscule Protestant converts in India compared to millions of Muslim converts. In a deeply religious country, that mattered.